Now More Than Ever, It Pays To Be A Deiter Bros. Customer! To reward customers like you for your loyalty, we created the Deiter Bros. REWARDS® Program, effective May 1, 2010. 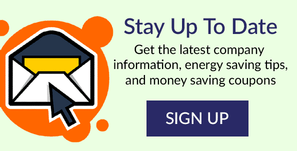 Now every time you purchase any of our quality fuel products, energy-saving heating OR cooling equipment, OR services YOU WILL EARN VALUABLE POINTS redeemable for goods or services from Deiter Bros. Likewise, if you refer new customers OR join our BetterWay® Budget Plan OR enroll for our new Paperless Billing customer convenience option OR sign-up for virtually ANY new program, product or service... you will earn REWARDS® Points. PLUS, your own personal account containing your REWARDS® Certificates and any redemption activity can always be viewed ONLINE in your own, fully secure account at https://www.dbrothers.com/manage_reward_program.cfml. YES, you can pay for future fuel purchases with REWARDS® points! 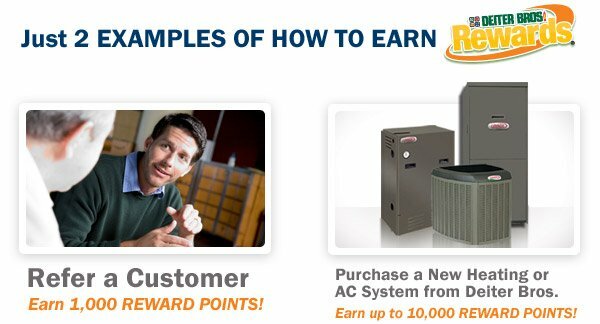 YES, you will earn up to 10,000 REWARDS® points for purchases on energy-saving heating and cooling systems from Deiter Bros. YES, you can bring a new customer to Deiter Bros. and you'll earn up to 1,000 REWARDS® points. Points are transferrable to new owners when a home is sold. Points are redeemed online against future purchases from Deiter Bros. There is no cash value to points. Points may not be redeemed against past due balances. Points will expire 2 years beyond the date on which they were earned. Points may not be transferred to other Deiter Bros. account holders. FOR MORE FACTS on the Deiter Bros. REWARDS® Program, Call Us at 1-800-DEITER-1. There are dozens more ways to earn Deiter Bros. REWARDS® points. Check back frequently for more information and offers regarding the Deiter Bros. REWARDS® Program!